The concept of fake news has been made famous by the new president of the United States Donald Trump. In my article The Confabulation of Trump, and in the update Donald Trump I show how my concept of The Matrix Conspiracy is correct, especially when seen in connection with the election of Trump. In the updates I show it in connection with the influence of the anti-intellectual and anti-scientific movement, and the beginning of a new kind of fascism (see my Matrix Dictionary entries Anti-intellectualism and Anti-science and The Matrix Conspiracy Fascism). Anti-intellectualism is hostility to and mistrust of intellect, intellectuals, and intellectualism commonly expressed as deprecation of education and philosophy, and the dismissal of art, literature, and science as impractical and even contemptible human pursuits. Anti-intellectuals present themselves and are perceived as champions of common folk—populists against political and academic elitism. They tend to see educated people as a status class detached from the concerns of most people, and feel that intellectuals dominate political discourse and control higher education. In short: popular culture is permeated with anti-intellectualism. It has almost become a reaction of the mind, when confronted with intellectualism. New Age is in that sense clearly a part of the popular culture, you might even say that New Age is the top ideology of popular culture. But in my Pop Culture Files I seek to bring Popular culture to philosophy, in order to show that many of the most popular themes in pop culture actually have very deep philosophical implications, which not at all are anti-intellectual and must be said to be in direct opposition to New Age. The danger in anti-intellectualism is easily seen when one consider what it has been used for. Totalitarian governments manipulate and apply anti-intellectualism to repress political dissent. During the Spanish Civil War (1936–1939) and the following right-wing dictatorship (1939–1975) of General Francisco Franco, the reactionary repression of the White Terror (1936–1945) was notably anti-intellectual, with most of the 200,000 civilians killed being the Spanish intelligentsia, the politically active teachers and academics, artists and writers of the deposed Second Spanish Republic (1931–1939). In the Communist state of Democratic Kampuchea (former Cambodia in Indochina of Southeast Asia), (1975–1979), the Khmer Rouge régime of Pol Pot condemned most of the non–Communist intelligentsia to death in the Killing Fields. Anti-science views have been amplified by the political wave of populism that is sweeping not only over America but also Europe. Populism is the key factor in the election of Donald Trump as the President of US. The key elements of this kind of populism are anti-elitism and nativism, which can translate into anti-immigrant views. The role of globalization in the creation of not only economic but also knowledge inequality has amplified these feelings of resentment. Populism is a mode of political communication that is centred around contrasts between the "common man" or "the people" and a real or imagined group of "privileged elites", traditionally scapegoating or making a folk devil of the latter. Populists can fall anywhere on the traditional left–right political spectrum of politics, and can often be characterized as centrist where populists portray both bourgeois capitalists and socialist organizers as unfairly dominating the political sphere. Political parties and politicians often use the terms populist and populism as pejoratives against their opponents. Such a view sees populism as demagogy, merely appearing to empathize with the public through rhetoric or unrealistic proposals in order to increase appeal across the political spectrum. Populism is most common in democratic nations. Political scientist Cas Mudde wrote that "Many observers have noted that populism is inherent to representative democracy; after all, do populists not juxtapose 'the pure people' against 'the corrupt elite'?" Another facet of the politicization of science is the effect of the postmodernism movement, which occurred in the latter part of the twentieth century, but has roots back to the Sophists in ancient Greece. I have characterized postmodernism as the intellectualism (or rather anti-intellectualism) behind New Age and the Self-help industry ( see my article Constructivism: the Postmodern Intellectualism behind New Age and the Self-help Industry). This movement represents a distrust of the Enlightenment principle of rationality. Although the term postmodernism has traditionally been applied to the humanities, it has broad implications for attitudes toward science, promoting the idea that truth is contextual, depending on one´s culture, education, and life experiences. This attitude is misplaced when dealing with scientific facts. Journalism has a great role in promoting the “other side” of disagreements regarding scientific issues, even when the weight of evidence overwhelmingly supports one conclusion. This mistakenly gives opinion the same weight as fact. One of the unfortunate results of postmodernism is that individuals see scientific issues in ways that fit their preconceptions and make them comfortable. As individuals mature, they may gravitate toward the political party whose views they share on other nonscientific issues. The public´s gravitation to biased television reporting, social media, and Internet resources that fit their worldview as sources of information on scientific issues further calcifies their opinions. To see this in the New Age movement is especially disturbing, because New Age at the same time are promoting spiritual issues, which in that way are being deeply distorted. It is namely so, that when you make a google search on spiritual issues, you will almost inevitable end up on a New Age promoting site. Related to this is the Matrix Dictionary entry on The Illusion of Knowledge. So, in our time with the spreading of subjectivism and relativism - and therefore Magical thinking - we are seeing how the thought distortion Confabulation somehow gets a justification. There is in fact - as I claim in my articles and books on The Matrix Conspiracy - a New World Order emerging: the world of Alternative History, Alternative Physics, Alternative Medicine and, ultimately, Alternative Reality. As mentioned: that my concept of The Matrix Conspiracy is correct, is today especially emphasized by the election of the new president of the United States, Donald Trump, and his government, who are defending concepts of “alternate truths” about Trump´s ideas, and “fake news” about any critique of him. This without much consequence, and without much protest from his many electors. Already now, another president, namely the Syrian president Assad, has found this inspiring and is saying that the allegations of torture and mass hangings in his country is the product of “a fake news era” (paradoxically enough, in the moment of writing the main article, Trump has just ordered the missile attack on Assad). Trump is completely indifferent to what is true and false, never speaks positively about democracy, equality before the law or human rights. He openly admires foreign dictators, who define leadership as the ability to suppress the opposition and who led an election campaign where people who contradicted him were removed by force. So, we actually have a quite good idea about what we are dealing with. 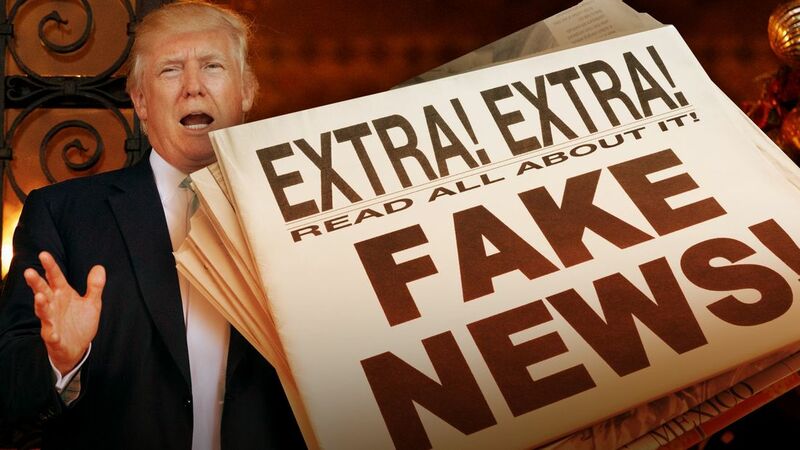 Fake news is a type of yellow journalism or propaganda that consists of deliberate misinformation or hoaxes spread via traditional print and broadcast news media or online social media. Fake news is written and published with the intent to mislead in order to damage an agency, entity, or person, and/or gain financially or politically, often using sensationalist, dishonest, or outright fabricated headlines to increase readership, online sharing, and Internet click revenue. In the latter case, it is similar to sensational online "clickbait" headlines and relies on advertising revenue generated from this activity, regardless of the veracity of the published stories. Intentionally misleading and deceptive fake news is different from obvious satire or parody, which is intended to amuse rather than mislead its audience. The relevance of fake news has increased in post-truth politics. For media outlets, the ability to attract viewers to their websites is necessary to general online advertising revenue. If publishing a story with false content attracts users, it may be worthy of producing in order to benefit advertisers and ratings. Easy access to online advertisement revenue, increased political polarization, and the popularity of social media, primarily the Facebook News Feed, have all been implicated in the spread of fake news, which has come to provide competition for legitimate news stories. Hostile government actors have also been implicated in generating and propagating fake news, particularly during elections. Fake news also undermines serious media coverage and makes it more difficult for journalists to cover significant news stories. An analysis by Buzzfeed found that the top 20 fake news stories about the 2016 U.S. presidential election received more engagement on Facebook than the top 20 news stories on the election from 19 major media outlets. Anonymously-hosted fake news websites lacking known publishers have also been criticized, because they make it difficult to prosecute sources of fake news for libel. Fake news is a neologism often used to refer to fabricated news. This type of news, found in traditional news, social media or fake news websites, has no basis in fact, but is presented as being factually accurate. Michael Radutzky, a producer of CBS 60 Minutes, said his show considers fake news to be "stories that are provably false, have enormous traction [popular appeal] in the culture, and are consumed by millions of people". He did not include fake news that is "invoked by politicians against the media for stories that they don't like or for comments that they don't like". Guy Campanile, also a 60 Minutes producer said, "What we are talking about are stories that are fabricated out of thin air. By most measures, deliberately, and by any definition, that's a lie." The intention and purpose behind fake news is important. In some cases, what appears to be fake news may in fact be news satire, which uses exaggeration and introduces non-factual elements, and is intended to amuse or make a point, rather than to deceive. Propaganda can also be fake news. In January 2017 the United Kingdom House of Commons conducted a parliamentary inquiry into the "growing phenomenon of fake news". All in all: my claim is that the growing phenomenon is due to the Matrix Conspiracy, whose aim is a New World Order. Its teachers are the so-called sophists. We saw them already in Ancient Greece. After centuries of successful trading, the local gods and festivals could no longer satisfy the religious needs of the ancient Athenians. Their spiritual hunger was exacerbated by the stress of city life, by the constant threat of destruction, and by the grim vision of totalitarian Sparta: the vision of Greeks living without light or grace or humour, as though the gods had withdrawn from their world. So, the main theory of this ideology is relativism. There both exists an individual version of relativism, and a collective version. The individual version is called subjectivism. This version is often connected with a right-wing liberalism. The other version is a collective relativism, cultural relativism, which often is connected to a left-wing socialism. However, both are common in distorting both science and human rights. Both are demanding “alternative” views of science, and for example also human rights. And both are introducing intellectual apartheid in different ways, by seeking to eliminate critical thinking. Both subjectivism and relativism claim, that there doesn’t exist any objective truth. Truth is something we create ourself, either as individuals or as cultures, and since there doesn’t exist any objective truth, there doesn´t exist any objective scale of truth. Therewith they also say, that we live in a Matrix, a dream, a kind of virtual reality, we have created ourselves, and that there is no chance of getting out of this. Therefore, the best is to be interested in finding ways of getting on in this world, rather than being interested in finding ways of discovering the truth. To teach people this, is the main job of the Sophists of the Matrix Conspiracy: Management theorists, New Age coaches, Nonviolent Communicators, Neuro-linguistic Programmers, Law of Attraction gurus. In that connection we see the growing phenomenon of Diploma Mills and Predator Open Access Publishing, where the goal is to blur the line between fake and false scientists and other scholars. Plato was especially concerned about the blur of the line between fake and true philosophers. [Note that there both are academical and non-academical philosophers, and that a university education isn´t a protected title. But today it certainly gives you some kind of guarantee. (Examples of genuine non-academical philosophers are Krishnamurti, Karen Blixen, Antoine de Saint-Exupéry, J.R.R. Tolkien. Krishnamurti was the most formel. The others introduced me to genuine philosophical questioning in an informal literary way. And all have been inspiring for the development of my own teaching]. In spirituality the tendency is resulting in the blur between false and true gurus. The whole movement is especially characterized by the claim that it is problematic to make this discrimination at all, so that you are getting a feeling of guilt if your try to. But that´s a part of the anti-intellectual propaganda. 5 things to keep in mind when fact-checking claims about science is an article on the website Poynter - a global leader in Journalism (November 5, 2015). If it seems to you that science-based claims do not need solid fact-checking, you would be wrong. Just look at the misinformation that spread around the world last week about the perils of eating red meat. SciCheck, launched by FactCheck.org in January, is one example of fact-checkers dedicating themselves to debunking claims made about science. In many cases, politicians and media misquote scientific findings, as with the WHO research on the carcinogenic nature of red meat. In these instances, fact-checkers merely need to point out that there is a basic problem with the interpretation of the research. Other times, fact-checkers show that certain claims are based on blatantly flawed data. I reached out to Nuzzo and with her help compiled a non-exhaustive list of precautions that fact-checkers could take when dealing with scientific research as evidence…[presents the 5 things]. We are all perhaps overly familiar with the issue of weird or dubious statements and claims. Up pops one that triggers your BS alarm, and you then wonder how you can dig into it and find the truth. The rather obvious solution is of course to google it and see what turns up. While that might not always yield links to reliable unbiased sources, it usually does. If an initial search yields no useful results, then add to your search words such as “skeptic” or “criticism” and see if that helps. But how do you then fact check what google delivers? What are the Top 5 Fact Checking sites? This is perhaps a wholly subjective list, and so the idea that they are the definitive top 5 is open to challenge. I have however found them all to be incredibly useful at times.